The main reason for realizing a national forest inventory was the high interest in wood resources information in Romania due to the development of the forest industries by the end of 1950s. Starting in 1948, a forest management planning system was implemented over the entire Romanian forestry fund and the tradition at that time was to realize the stand-wise national inventory by aggregating stand inventories originally designed for management planning purpose. Indeed, all Romanian forests became public properties in 1948 and started to be unitary managed by state. Based on the information contained by the forest management plans, national inventories of the forestry fund were elaborated in 1965, 1973, 1980 and 1984. A National Forest Inventory (NFI) was initiated in 2006, which is designated to cover all Romania’s forest vegetation, meaning the forestry fund, the woodlands outside of the forestry fund and trees outside forests. The Romanian Forest Research and Management Institute is responsible for the NFI design and implementation, field measurements, as well as results calculation and publication. The Romanian NFI is inspired from different NFI systems that are currently in use in European countries. Its characteristics were adapted to the size and the landscape conditions of Romania. Nowadays, NFI are required to provide with information far beyond the simple forest mensuration. The new NFI was therefore conceived from the beginning to enable the measurement on a systematic grid of all the information that are required for carbon reporting under Kyoto Protocol and forest biodiversity. A pilot inventory has been conducted in 2007 and 2008 in order to verify the feasibility of the methods developed, adapt them when necessary and ensure a proper inter-calibration of the field crews. The demand for accurate national-level forest statistics is very high nowdays, as the last full inventory was done over 20 years ago, and forest actors from both the public and private sectors are in great need of data on the current forests state. The NFI information will be used to set up the national forest policy, which will be expressed in forest legislation and national forest programs for sustainable forest management. It would also be used in decision-making processes concerning the development of the forest industry, and to provide forest resource information for national and international statistics reporting (FAO Forest Resource Assessment and the Ministerial Conference on the Protection of Forests in Europe) and to provide with information on forest health and damage, biodiversity and carbon pools. The Romanian NFI is designed as a continuous forest inventory (CFI) with a five-year inventory cycle. It is based on a systematically sampling, combine repeated measurements of permanent plots with measurements of temporary plots and it is a two stage NFI (aerial photos and field forest measurements and assessment). 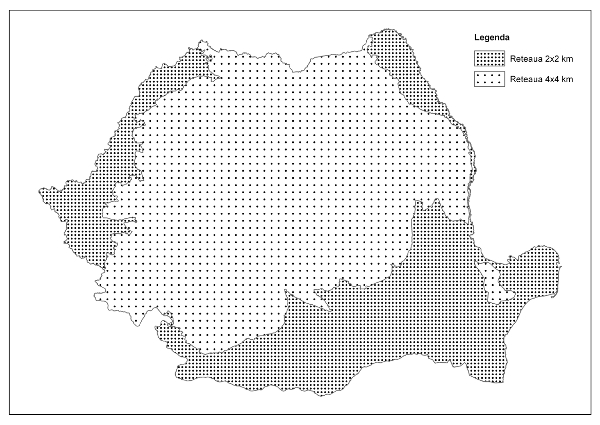 The Romanian NFI covers the entire country territory and it is based on a 4×4 km grid (Fig. 1). The density of grid is higher in plain area (2×2 km) because of a very low forest cover. The way plots are selected each from the grid is shown in Fig. 2. A systematic grid of 500x500m covering the entire country territory is used to determine forest area and land use (and land use change) categories on orthophotographs. 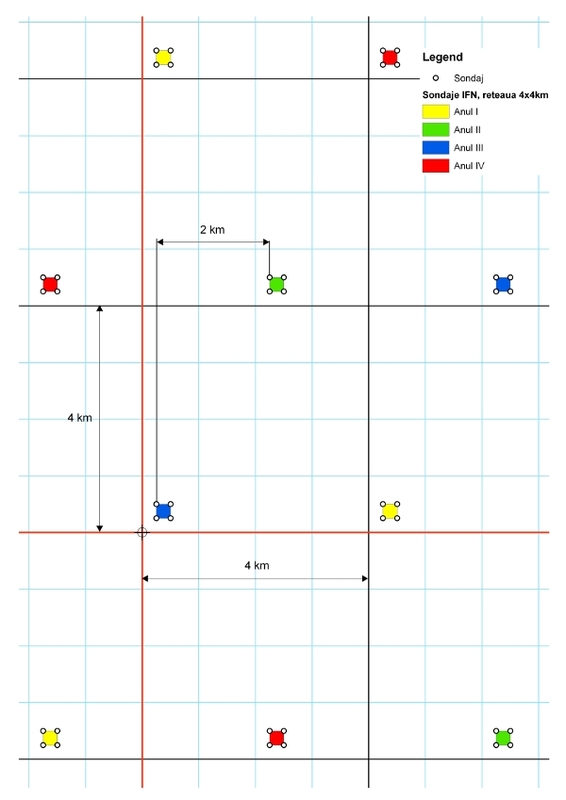 In order to increasing the efficiency of the field work, the measurements are realized on four sub-plots of clusters located on the corners of a 250×250 m square that lies in the south-west corner of the 4×4 (2×2) km grid (Fig. 3). The field forest inventory would comprise at the end of the five-year cycle about 24.000 permanent and 5.000 temporary sample plots. Temporary sample plots would be systematically selected also. 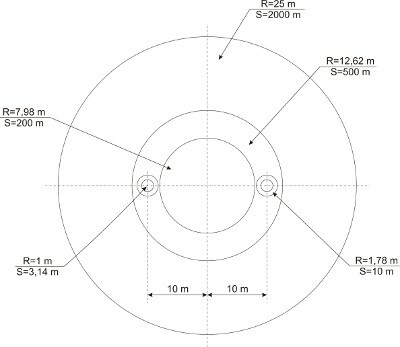 two circles of 1,78m radius for trees over 50cm height and under 56mm DBH. 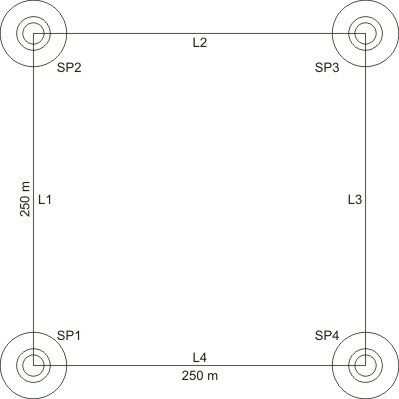 a circle of 25m for description of forest site, forest type, soil characteristics and forest edges. The set of measurements realized on each of the sub-plots was designed to not only estimate the forest resource and its growth, but also to enable accurate reporting of the carbon pools. Therefore, apart from the classical trees biometric measurements, litter and soil characteristics are described and soil samples are taken. The inventory protocol should enable in the future the estimation of mineral and organic soil layers under forest use and changes in soil organic carbon. Because the NFI is the first systematic national inventory after a long period, the estimation of forest growth would rely on dendrochronological measurements. Fields crews therefore systematically core from 3 to 6 trees per plot and the increment cores are processed in order to accurately estimate trees age and to compute their growth over the last 5 years. Fig.4. Layout of the terrestrial sample plot components. Each circle represents a different sampling zone with specific measurement and measurement rules (refer to the text for more details). Radius and surfaces are provided for each. The estimation of the forest area is based on the total country land and inland water areas, which is known or assumed to be error-free, and the proportion of points from the 500x500m NFI grid that are on forest. The volume estimation is based on national-wise species-specific equations, with DBH and height as input variables. These equations have a high accuracy and their coefficients of regression are personalized for 43 main tree species. For the coniferous species, the equations refer only to the stem volume, without branches. The height is measured for each sample tree. The total drain estimates in Romania are based at the moment only on the annual statistical reports made by the forest districts and forest industry companies. The measurement in NFI permanent and temporary sample plots will be used for drain estimation in the future. The Romanian multi-purpose NFI based on a systematic sampling scheme started in 2008. First cycle final results are available since the end of 2012. Romania is offering a great diversity of landscapes, most of the forest is located on mountains, often in remote zones hard to access. But the protocol and the equipment acquired are designed to offer a performant inventory that can provide all the data required for a detailed reporting and precise estimations of the forest resource. The inventory is not focusing on the forest composition and volume only but would also provide with direct estimations of carbon pools and biodiversity, of the accessibility, of the ownership, of its state, etc. Care was indeed taken to ensure that the NFI information comply with the good practice guidelines recommanded for the United Nations Framework Convention on Climate Change and for assesing the biological diversity of forest.